Things tend to slow down in the cold, and Hearthstone is no exception. After the recent Knights of the Frozen Throne expansion, games are getting longer, and more methodical. But if you were hoping to play Frozen Throne in a more casual setting—say, on the throne—your days of five-minute games might be over. After the release of pretty much every Hearthstone expansion, we see a very familiar pattern play out. First, players build late game-oriented decks so they can try out all the fancy new cards they got. Then, in ranked play, a few aggressive early game-oriented decks prove that they can beat those late game decks at least half the time, rendering those playstyles inefficient for climbing the ranked ladder. The meta splits, and the ladder fills with decks that aim to kill the opponent early. I might end up eating my words here, but with the launch of Knights of the Frozen Throne, that cycle may finally have been disrupted in a concrete way. It seems that the metagame has shifted toward the slow side. The king of the ranked climb in almost every expansion so far has been an aggro-type deck. Pirate Warrior, Aggro Shaman, Aggro Druid, Aggro Paladin, Face Hunter—the pedigree of strong aggro decks goes all the way back to Hearthstone’s earliest days. With Frozen Throne, though, it seems that the metagame has shifted toward the slow side in a much more concrete way this time around. Not only do decks have strong anti-aggro options to make sure they can survive until the late game—Spreading Plague, Defile, and Lifesteal minions come to mind—but there are also multiple late-game tools that let otherwise-weak late game classes scale to the point where games can last for twenty or thirty minutes each. And yes, I have data to back this up: stats show that as of a week ago, Frozen Throne games on average are lasting almost a full minute longer than they did at this point following the Un’Goro launch. There’s an elephant in the room here, of course, and it’s the Druid class, which currently rules the Hearthstone meta. With Knights of the Frozen Throne, many of Druid’s previous issues have been patched up, and now it’s the deck to beat. But even though the Druid class has strong aggro deck options, a lot of the class’s most direct counters take a while to reach full steam. I thought for a long time that this kind of slower, control-leaning metagame is what I wanted, and that late-game decks would be less infuriating because they would afford me more opportunities to play well and give my opponent more opportunities to screw up. I’d argue that to an extent, this has actually come to fruition. Today’s value-centric control matches require game knowledge over reflexive face-hitting. Misplay one card, and you lose an otherwise-winnable game. But what I wasn’t prepared for is the hell of being beaten after a 25-minute slugfest, or the Sisyphean anguish of completing only three ranked Hearthstone games over the course of an hour. Others are finding the slowdown a bit of a bummer as well, like the Redditor who lamented the death of “poop and play.” Tongue-in-cheek as that comment may be, there’s a concern that mobile players won’t be able to finish quick games on public transit or before bedtime without staying up late. While not every game will be an epic slog, and players who want to speed things up can always opt for faster decks, this slower Knights metagame is a chance for us to get up-close-and-personal with the implications of a control-oriented Hearthstone. 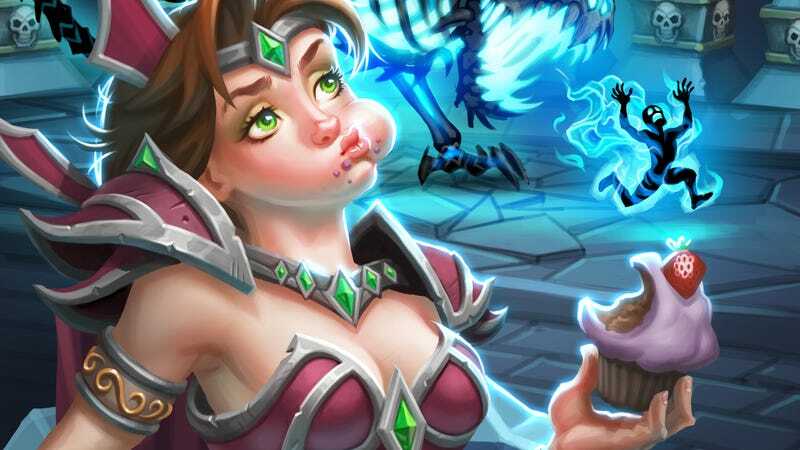 And while it does offer more chances for outplays crazy one-off situations, the truth is that I’m not sure I want Hearthstone games to get any longer than they already are.